View from look out deck. 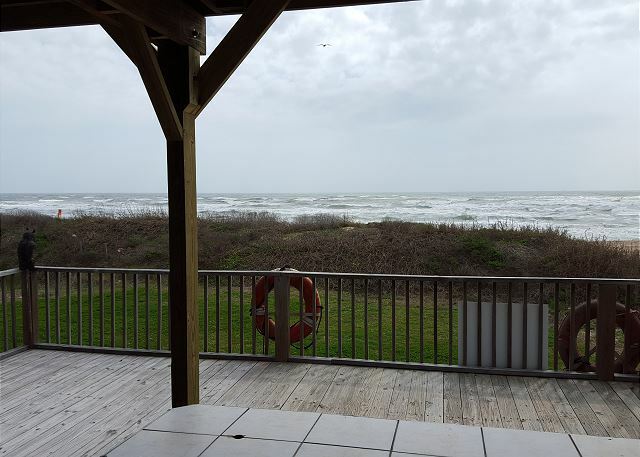 View of the Gulf of Mexico from under the look out deck. Partial view of living area. 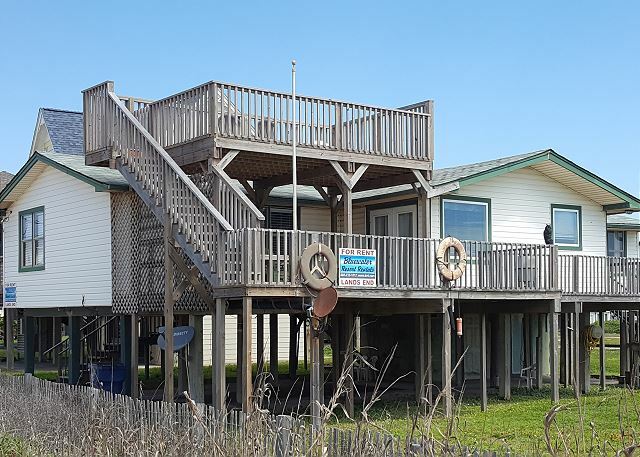 We have rented this house several times, we love the addition of deck cover and upper deck. We spend most of out time outside, so the deck cover created a nice big sitting area. Only complaint we have would be the bed mattresses. Pretty rough sleep. Land's End is like a home away from home. We've stayed there four or five times so now we know where everything is, indoors and out. 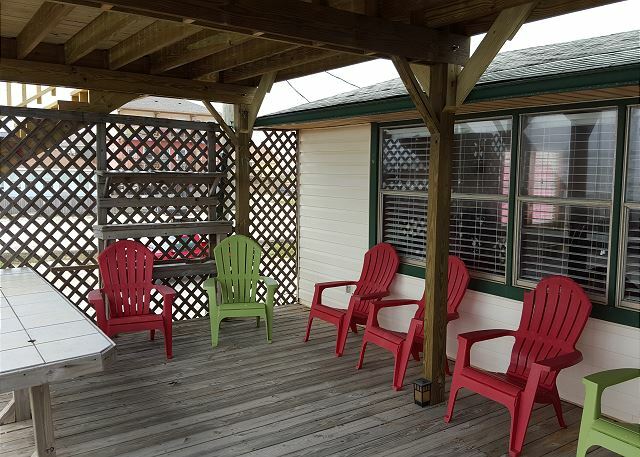 It has a terrific beachfront view, with easy access to the beach, and is within walking distance of Kitty's Purple Cow, the Seahorse Bar and Grill, the Red Snapper Inn & Restaurant, and Surfside Liquor Store. Two nice decks let you hang out in the fresh air either on the main level or on the "widow's walk" at the top. The building isn't new (we always have trouble unlocking the door! ), but it's in good shape, it's large but not huge, so it's perfect for smaller groups, and it has all of the needed amenities for a weekend or a week-long stay. Did I say that you can't beat the view? You really can't. Great location. Had an issue with the AC, but the staff had it repaired quickly. All around good experience. Several of my friends have been renting from Brannan for over 15 years. We keep coming back because they have the best service and price. We stayed at Lands End, next door to Pirates Alley, front row on the beach. We had to walk maybe 20-30 feet and we were right on the beach. There is a kitchen table, dining room table, and bar area, so plenty of room to sit and eat or play cards. The new upper deck is perfect for watching the sunset. While the house could use updating, it was spacious, clean, and suited our needs just fine. Letha, at Brannan Rentals, was very informative and so nice. We ate a great burger at a local bar, The Jetty Shack, and had more great food at Sharkies. This was my 5th time renting from Brannan Resort Rentals, and my 1st time at Lands End. My weekend stay was great, the house is very spacious, great location to the beach. My only concern was ants in the kitchen area and washroom. Overall great house and I will be renting this on again. Wonderful view, great location and pleasant amenities. At the foot of the stairs at entry a lot of trash that could be picked up, (bottle caps, butts, etc.) first appearance is important. This would be a real easy fix. Also we all feel that the vacuuming and sweeping should be a job for the landlord regardless the time of year, the prices that we pay should be enough to cover maid service. Also twin bed mattress needs replacing. Our first time in this location after several vacations in other properties. This is a great house in a great location. Walking distance to several restaurants and the local liquor store. 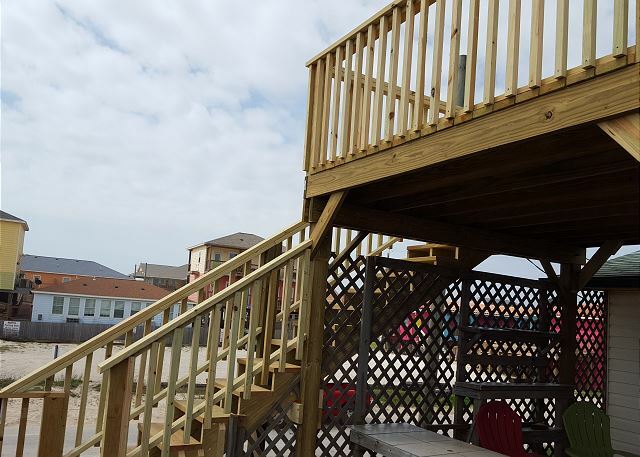 A protected view of the beach from the lower deck and a wider view from the new, upper deck. Lots of space indoors to spread out. Good kitchen facilities, multiple dining areas, a comfortable living room. We can definitely see ourselves returning to Land's End. House location was great. Had plenty of room for our family. House was clean and all amenities worked great. Loved the deck views of the Gulf. Could eventually use an update but other than that we really enjoyed our stay. Definitely would go back. Loved that the beach was so accessible. We have been in this house before, however the wall of sand was a little too high this year, could not see the beach, only the water from the balcony. The master bedroom bed needs a new mattress. But overall a wonderful rental!!! The house was in great shape and had everything a family of six could need. The location was wonderful as well. The view from the house isn't real clear because the dunes have gotten a lot taller than the pictures but your still right on the beach. Close to restaurants, etc yet we noticed our end of the beach was much less crowded than further down. Best Location for Family and Kids! We had a great time and had PLENTY of room! The beds were clean and very comfortable. The view from the front porch was perfect. Our kids were the right distance from the water so we could keep an eye on them. Also underneath the house was a nice area to cook and just hangout. The kitchen had everything we needed. We would stay there again and recommend it for sure. Very clean rental, excellent location right on the beach and close to services, nice floor plan with lots of space, great rental for someone looking for a deal, not for you if you want something upscale. We had a great time. Perfect location. Right on the beach. Great views. Only drawback was that there was poor communication about final payment and picking up the key. No instructions in contract. But that was a minor deal. We had a great time and would hIghly recommend this location. This house is in the perfect location. It is on the edge of an undeveloped area, so the beach in front of the house is less crowded than either direction down the beach. It is within walking distance to a couple of restaurants. It has a huge deck with a table and enough chairs for everyone to sit outside and eat while overlooking the water. We saw pods of dolphins daily and the kids LOVED body surfing with boogie boards. Sleeping arrangements were perfect with enough room for blowup mattress when the kids did not want to share a bed. There is even an outdoor shower at the base of the steps up to the deck to decrease the amount of sand we tracked in. FYI - baby powder helps get sand off your skin. We love this place. Couldn't find a better place either direction we walked on the beach. I highly recommend this house. Looking forward to staying here again next year. 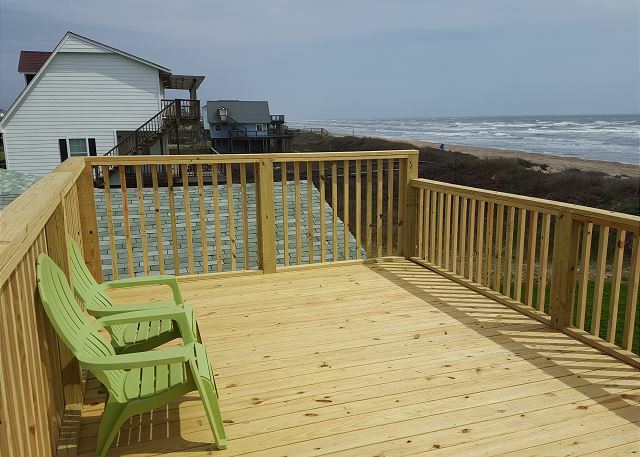 We had a wonderful time in Surfside and will definitely be renting from Brannan again! The house was awesome. The location is crazy great. Will definately rent again. Big house right on the beach, had a great time!! We enjoyed our stay very much at this big beach house right on the beach. The place had tons of dishes so cooking was a breeze, plus had lots of games and puzzles for the family. The house is within walking distance of 3 restaurants. We had a great time! My husband and I have rented multiple properties from Brannan and have been pleased with all. Brannan always takes good care of us; we wouldn't rent from anyone else. As one of the first guests to return after Hurricane Ike devastated Surfside Beach, I'm very impressed with the progress the town and its residents have made in their recovery efforts. Lands End was one of only two houses available for rent at Brannan, and it survived in great condition. Though there was a lot of recovery work going on around the beach, our stay was pleasant and relaxing: Lands End was a nice place for us to stay. Brannan deserves a lot of credit for working to accommodate our stay, and I appreciate their efforts to bring Surfside back to normal. This is the second year we rented Lands End and was just as happy this time as we were the first time rented. The view of the beach from the deck was perfect. There was plenty of room in the house to entertain family and friends. We will certainly return again. This is the 2nd year that we've stayed in this particular house. We had an absolutely wonderful vaction. I would recommend this house and this company. This is our second year to stay in this property. The property was clean, adequate dishes, utensils and appliances. We like the location and plan to rent it again in 2009. This was our 2nd year to stay in this house and plan to reserve it next summer also. Lots of fun!